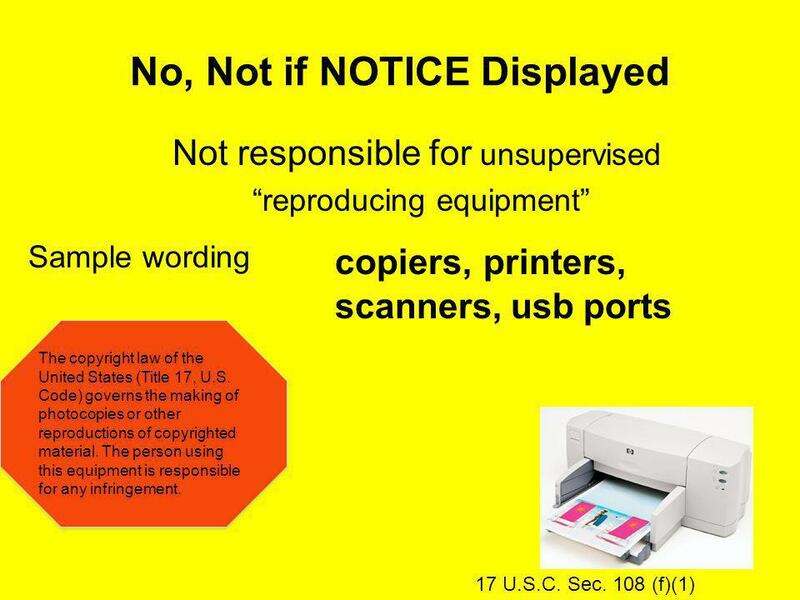 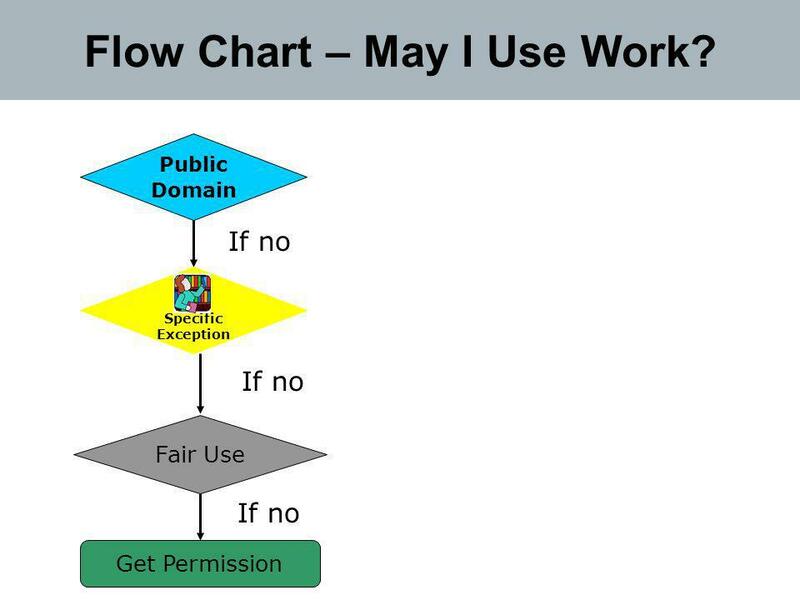 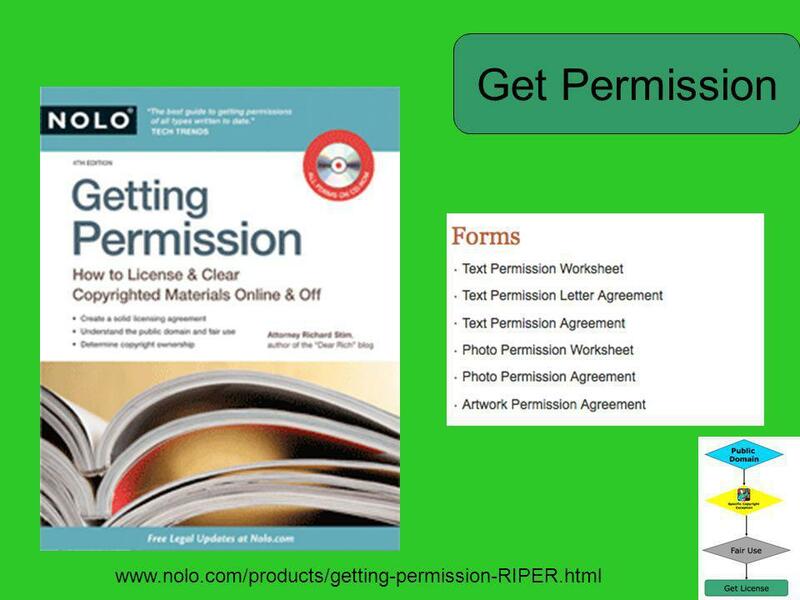 7 Public Domain Fair Use Get Permission If no Specific Exception If no Flow Chart – May I Use Work? 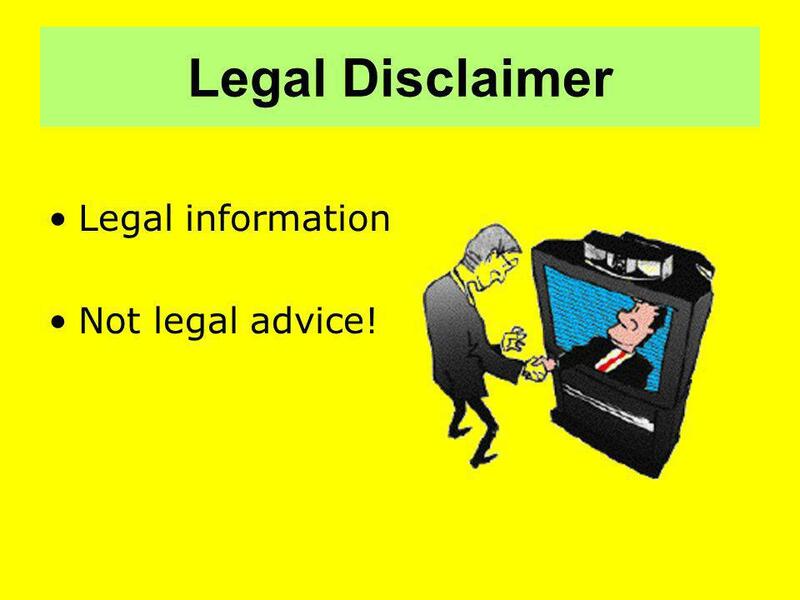 38 Questions? 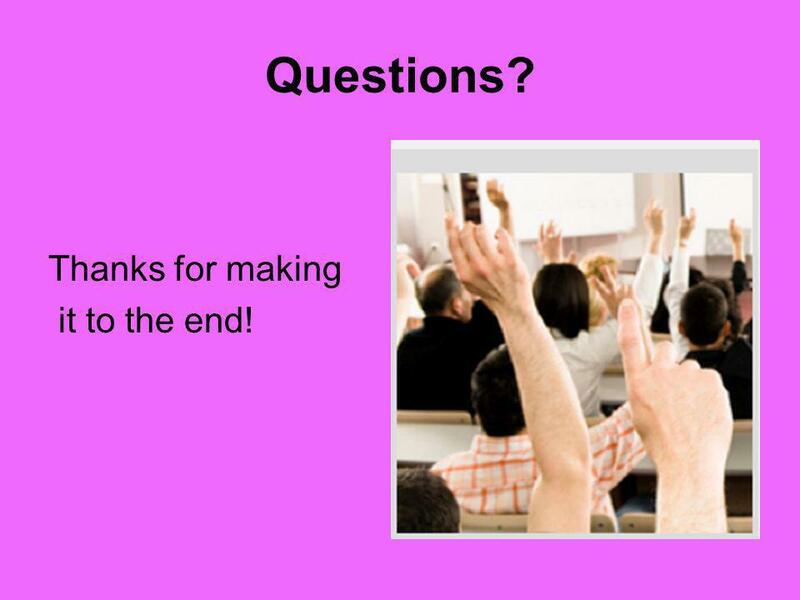 Thanks for making it to the end! 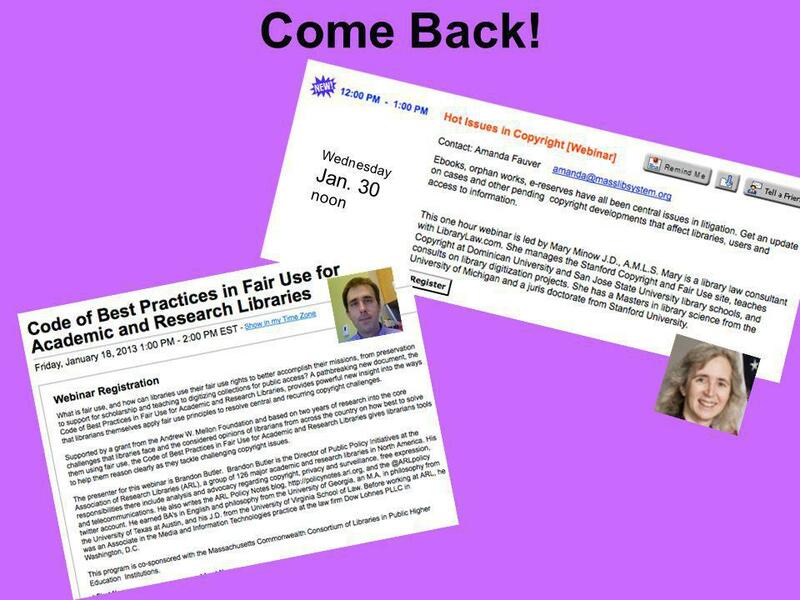 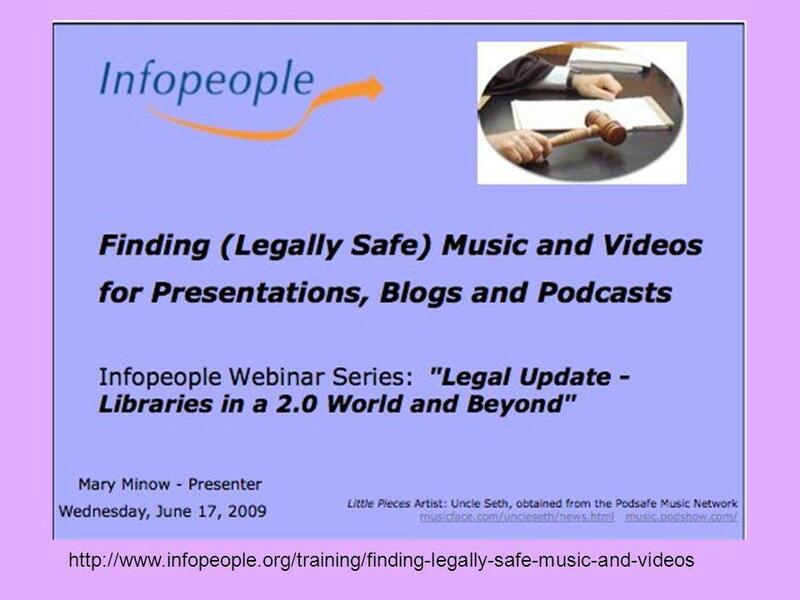 Download ppt "Copyright Basics: What Library Folks Really Oughta Know Massachusetts Library System Wednesday Jan 16, 2013 at 12:00 PM Presented by Mary Minow, J.D.,"
Copyright & Contracts: Moving Beyond Text in IRs Lisa Macklin. 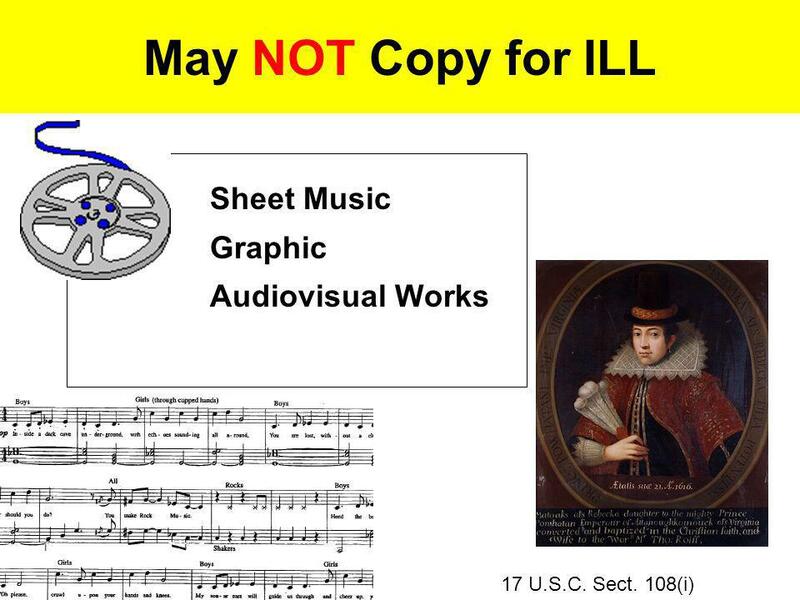 Copyrights. 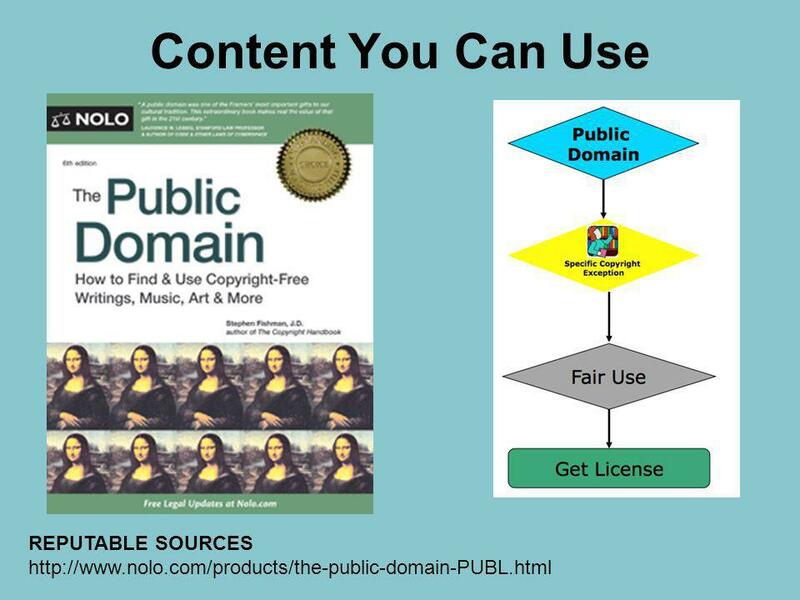 Copyright A form of protection for the author of published or unpublished original work, including writing, drama, music, art, and other intellectual. 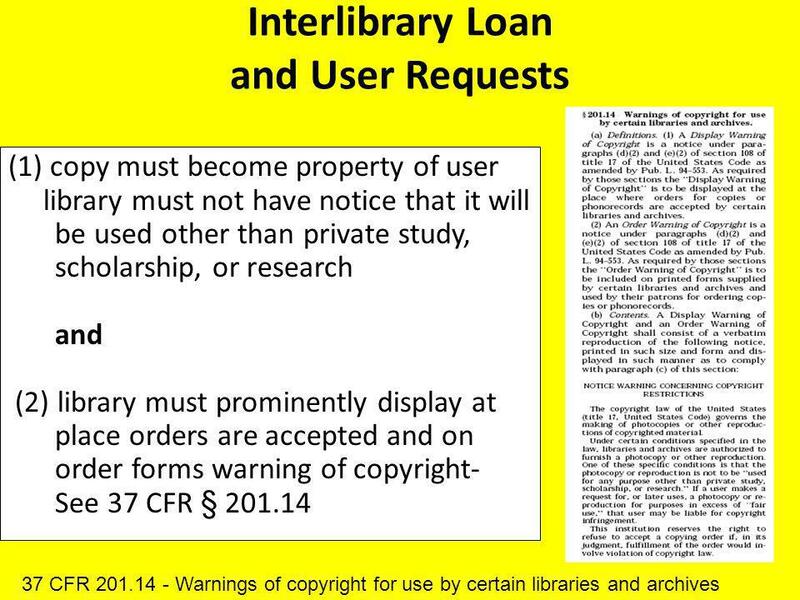 Interlibrary Loan Georgia Harper University of Texas System. 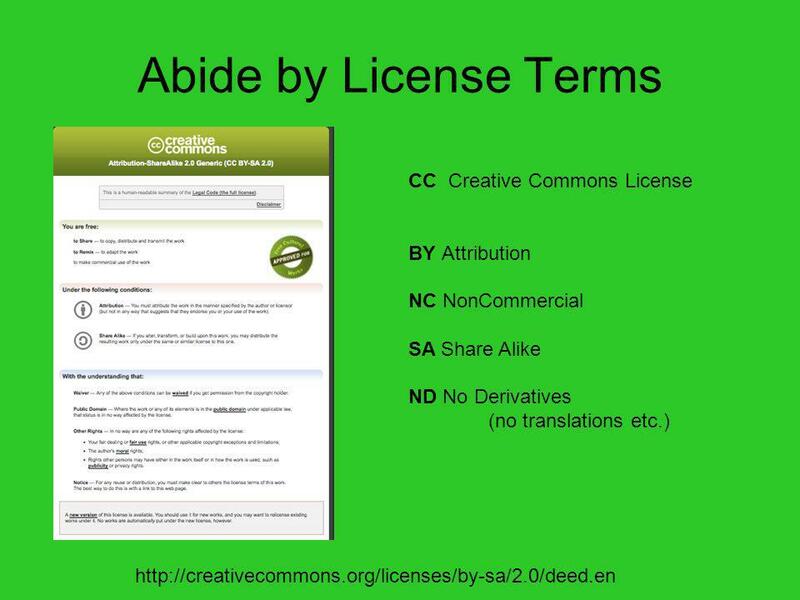 Creative Commons Creative Commons Wanna Work TogetherWanna Work Together Video What is Creative Commons? 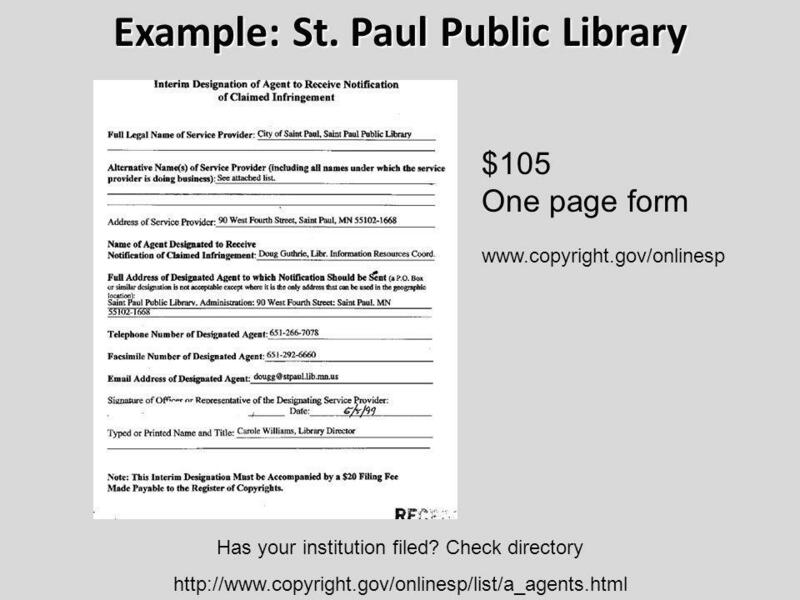 An alternative to. 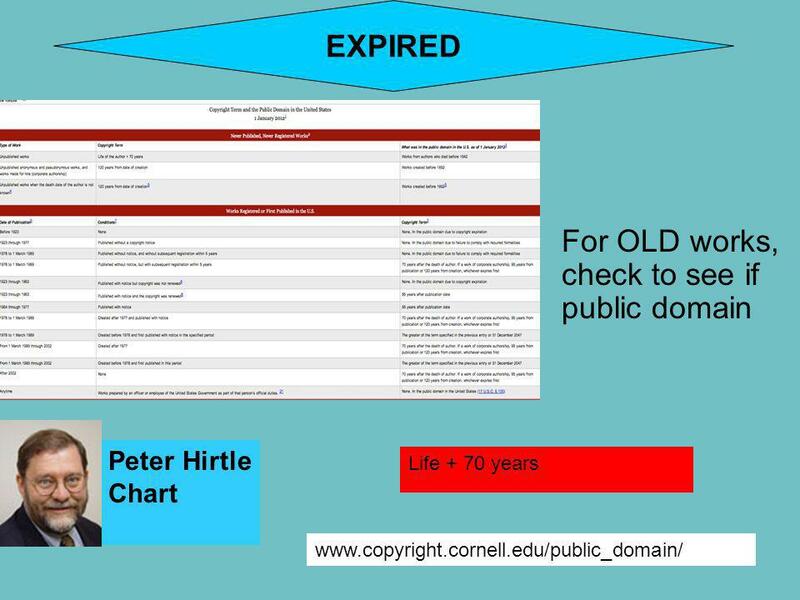 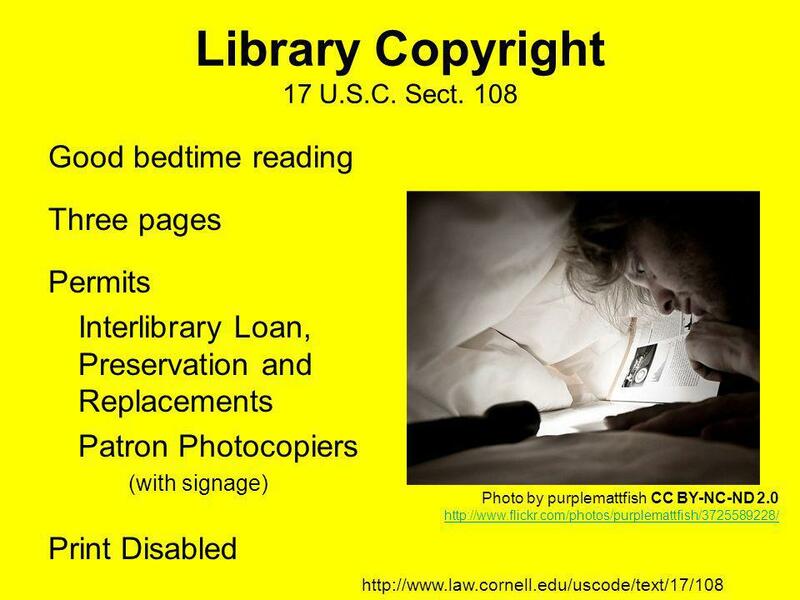 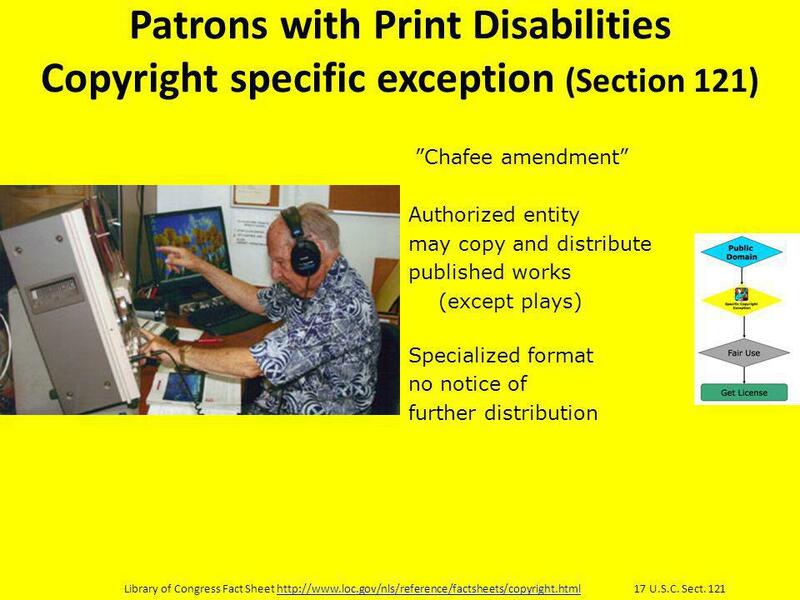 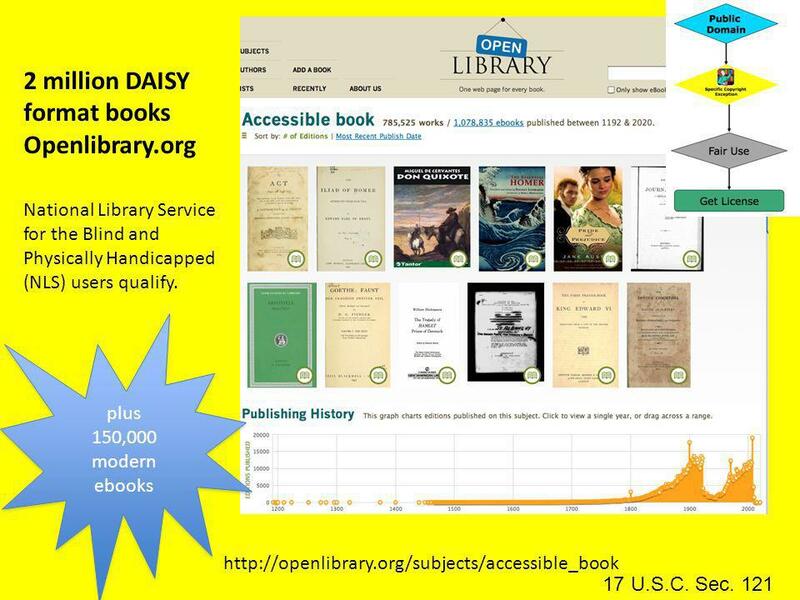 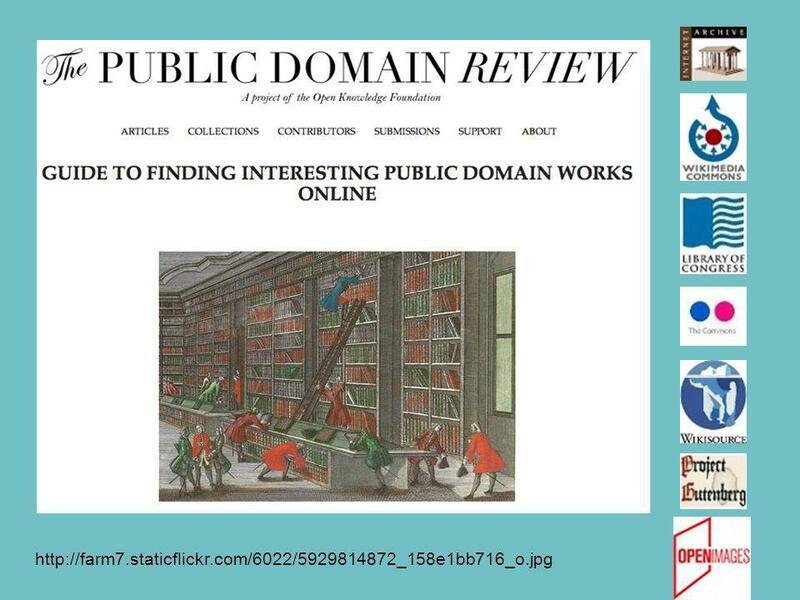 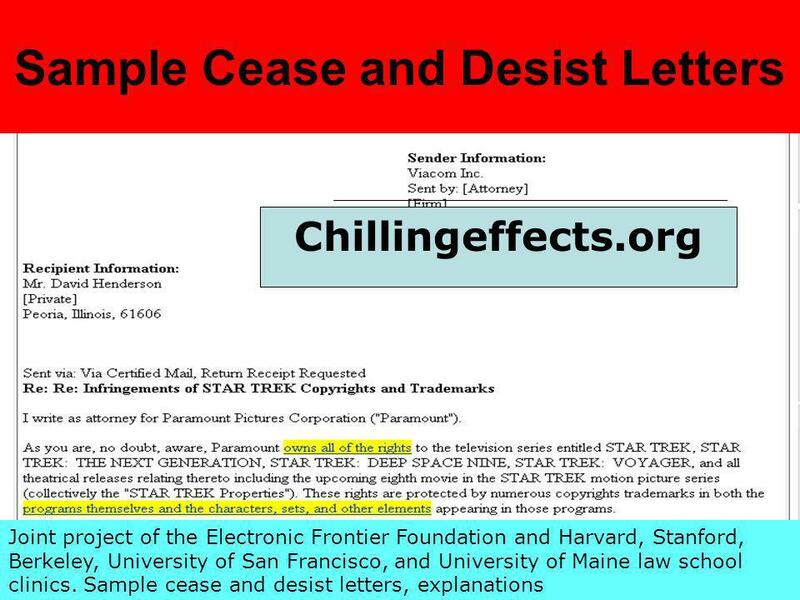 Libraries and Copyright in the Digital Age Section 108 exceptions for preservation & ILL. 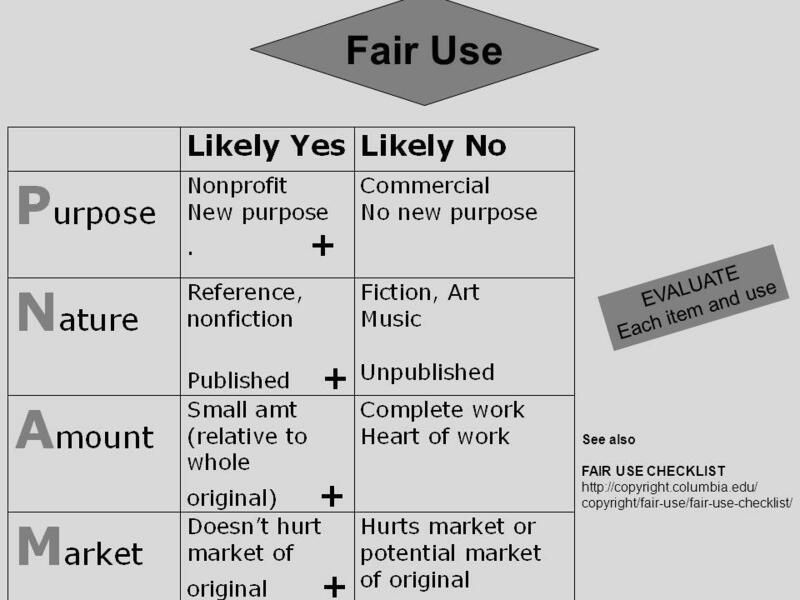 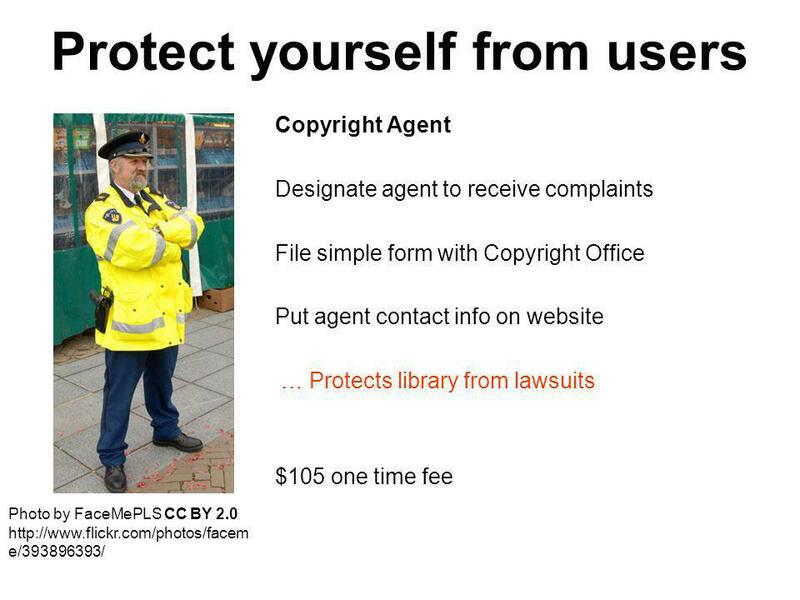 Objectives When should I consider Copyright and Fair Use? 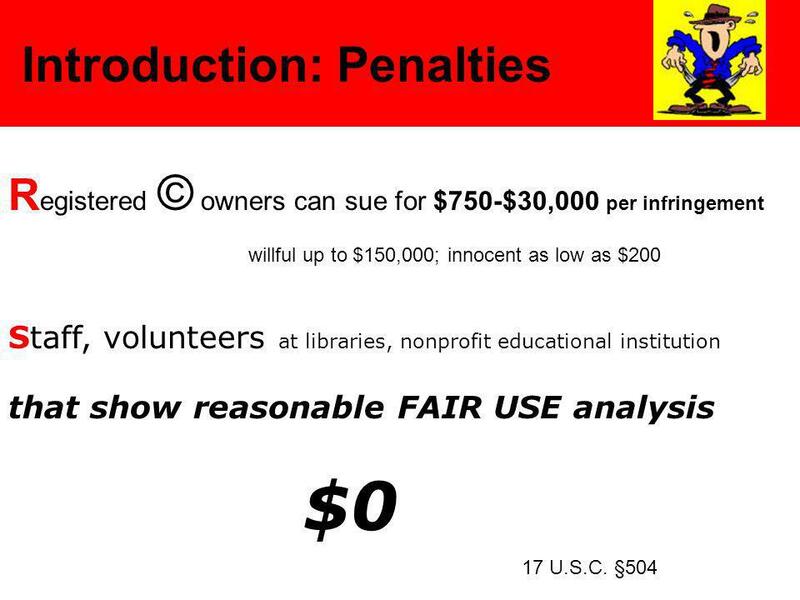 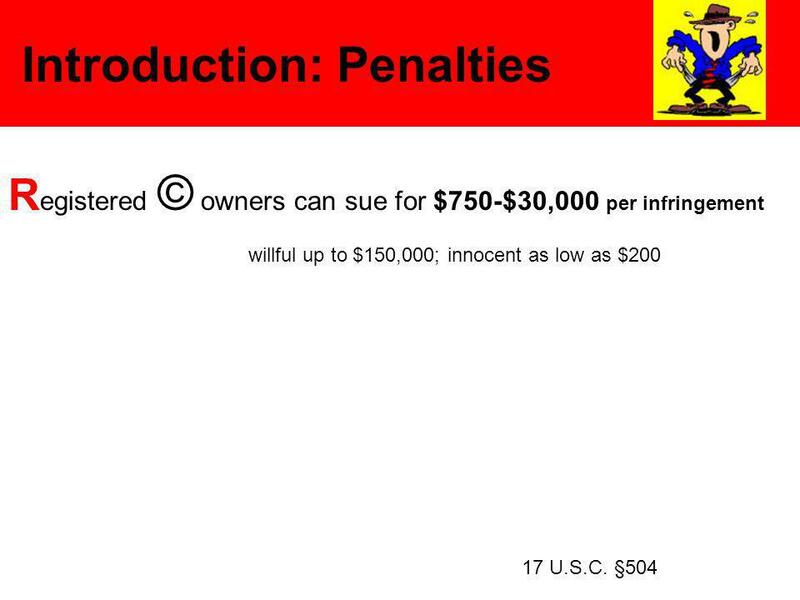 Why care about Copyright and Fair Use? 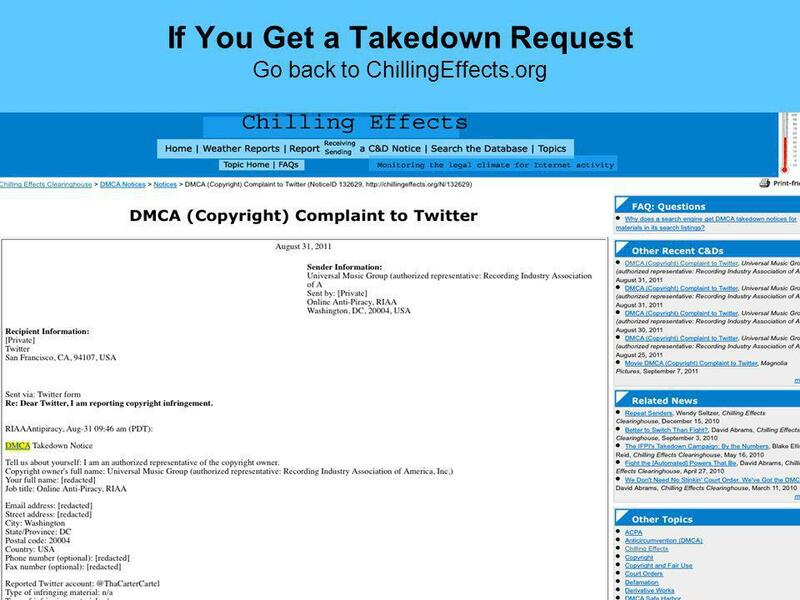 What are the chances of getting caught using copyrighted. 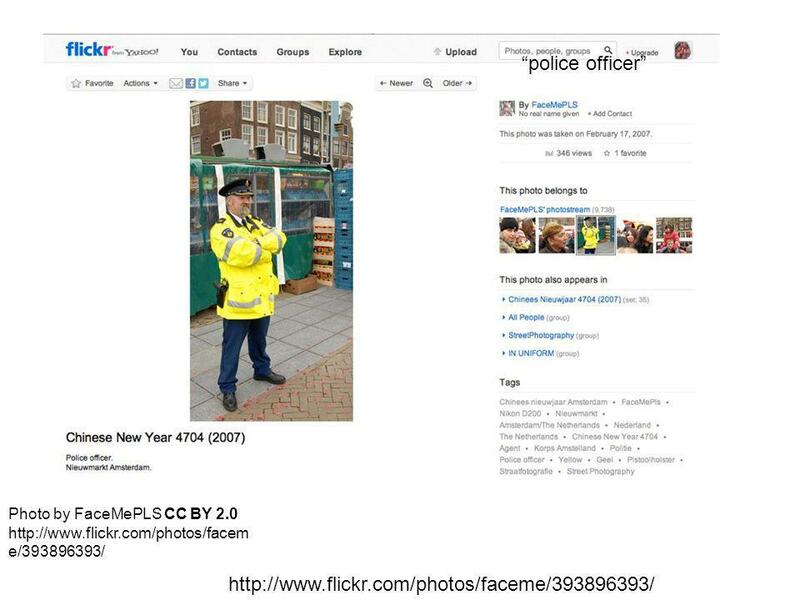 Using Flickr in Education. 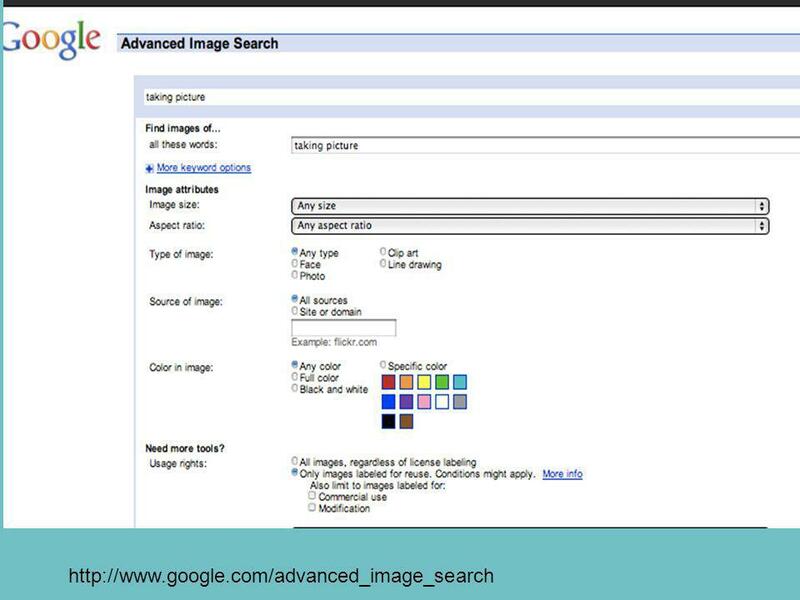 Ambition in Action Topics /What is Flickr /Using Flickr /Copy right - Copy left /Educational usage. 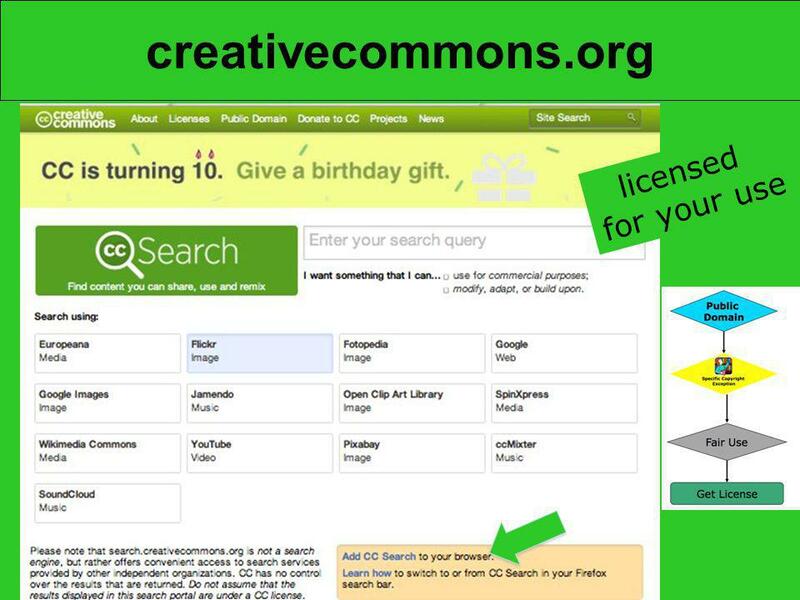 Open Education Resources Creative Commons Berenice Scott, Copyright Officer University of New England 19 July 2010. 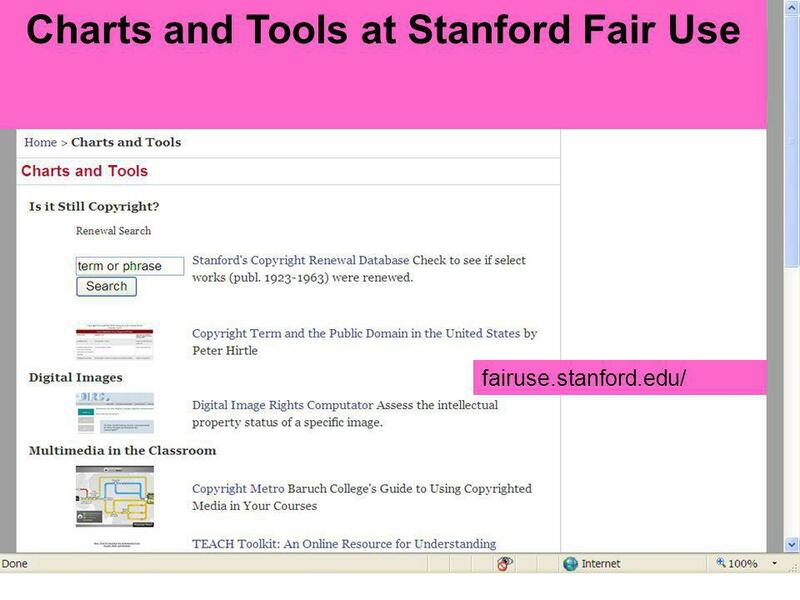 1 COPYRIGHT AND FAIR USE iTunes U Pilot Project Launch Meeting March 11, 2008. 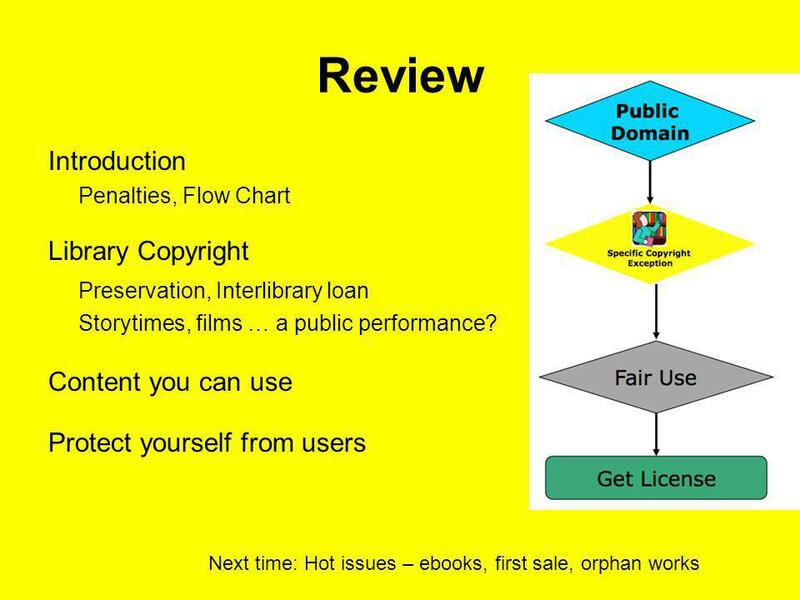 Responsible Authorship: Copyright Basics for Authors Dr. Bryan M. Carson, J.D., M.I.L.S., Ed.D. 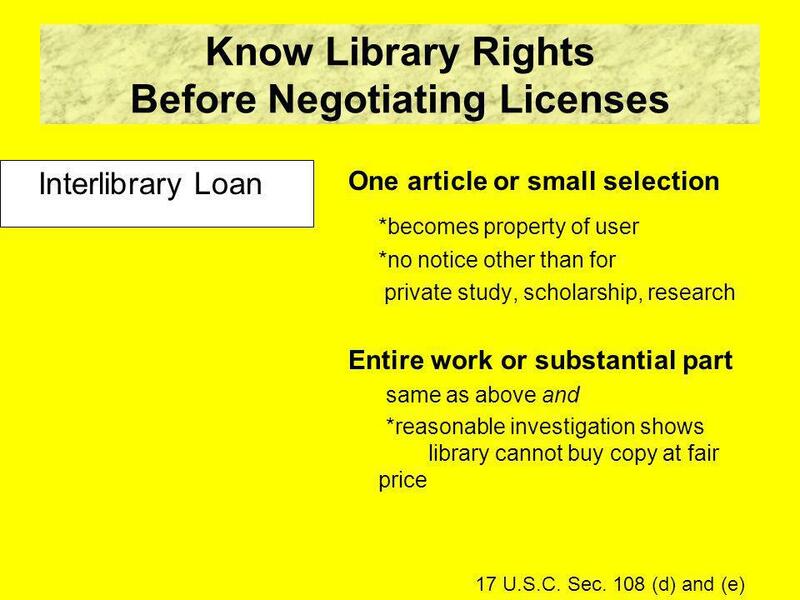 Western Kentucky University Libraries. 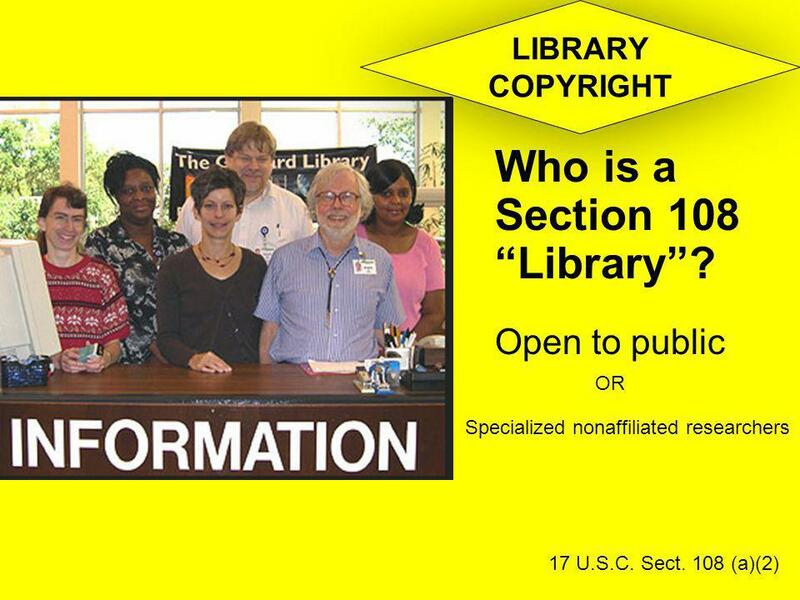 Section 108 Just for Libraries & Archives Allows for copying for: 1. 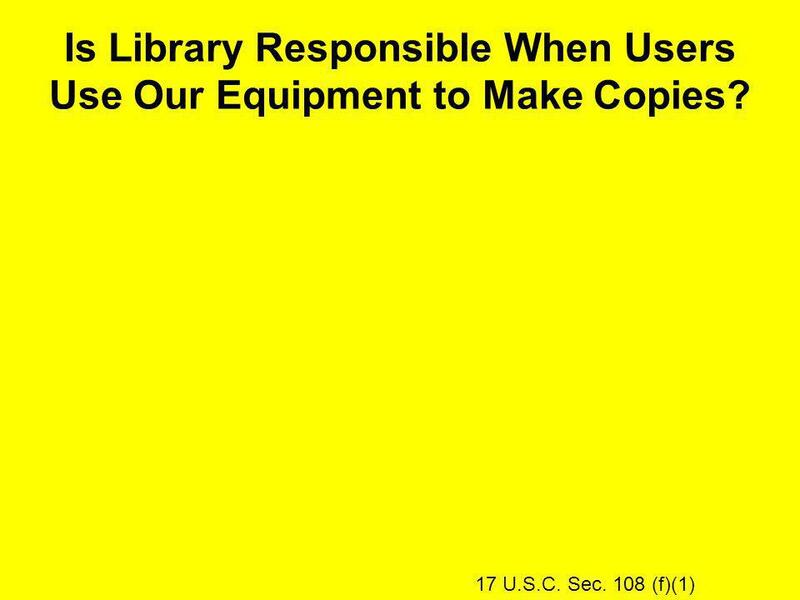 Interlibrary Loan; 2. 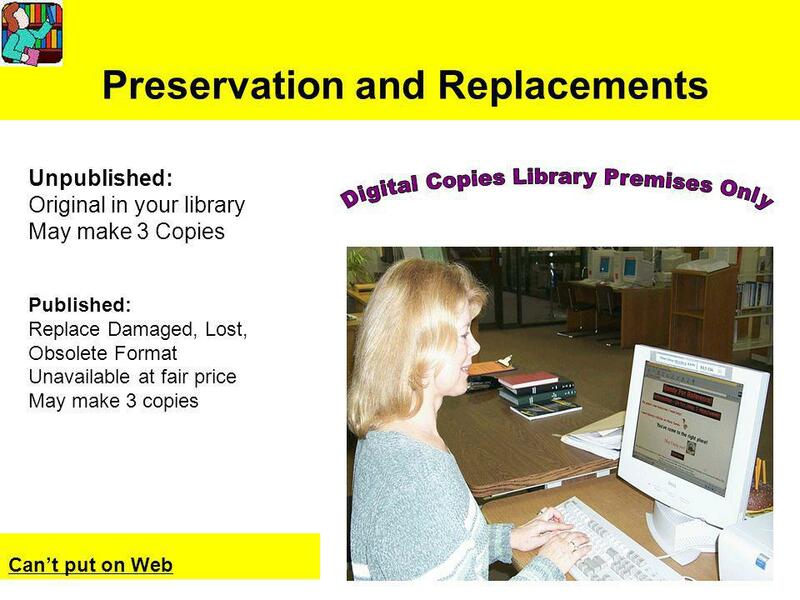 Replacing material in collection. 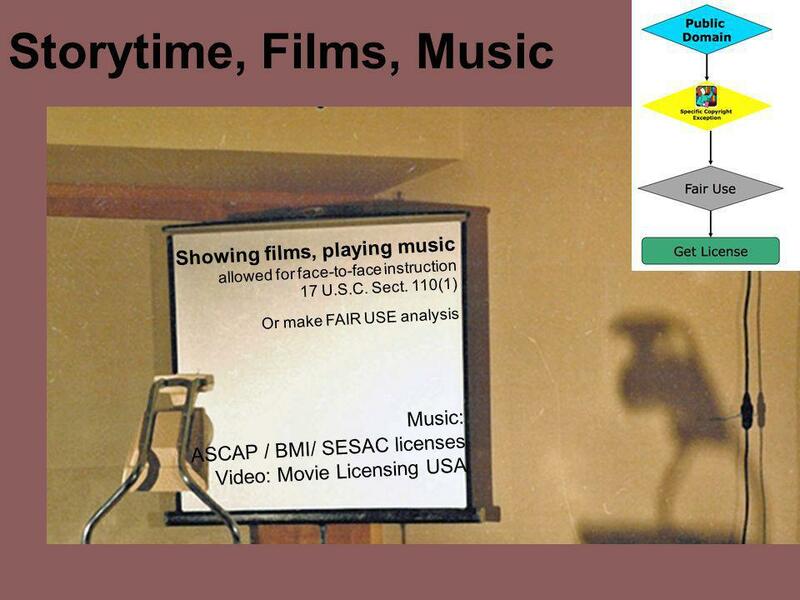 University of West Alabama. 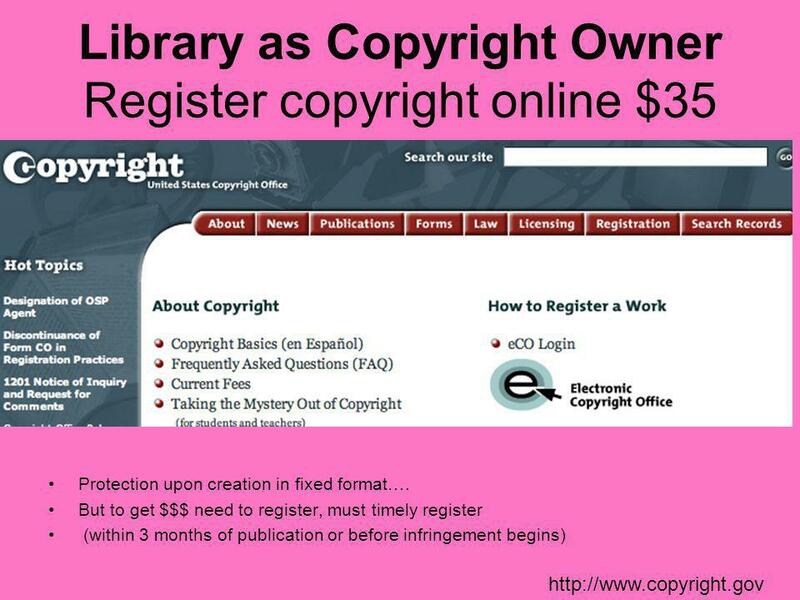 Copyright is a form of protection provided by the laws of the United States (title 17, U. S. Code) to the authors of “original.